While visiting the West Yorkshire History Center on the 11th of February – their pre-opening Open Day, I came across a display unit containing information about a WW1 soldier, and you know that I am not satisfied with just a name, regiment and service number. I like to put ‘meat on bones’, by finding family information, occupations and if applicable a place of burial / remembrance. Not every name I follow up in this way ends in a death and it is a good feeling when the information I add to this blog ends up with a veteran coming home to his family. Why did the pre-printed form from the Army grab my attention? The sheet, not only did it have a rank, service number, name of next of kin and information as to his health – the document also had a newspaper cutting that appeared to have been ‘stuck’ to the document nearly 100 years ago. 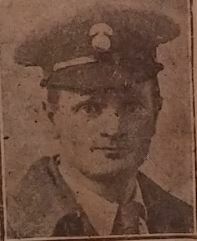 The newspaper cutting was a roughly cut out picture of John William Shaw. The small printed details told his address but no town – well the people who bought their local paper would know the area and probably know John William. Who was John William Shaw? Name, Service Number, rank, the branch of service, details of hospitalisation. Name of Next of Kin, address included on newspaper photograph (but no town mentioned). Firstly to search the easy bit, the Military records using his service number – some records are online but I’ll return to those later. In the meantime, a google search using the address on the picture – 22 Ramsey Street, Manchester Road, confirmed that John William lived in Bradford. The family home was a stone built terrace with a small front garden leading to the front door. In recent times the street has had all the stonework cleaned and looks as it would have done many years ago when the houses were first built – well apart from the cars lining the street and the Sky dishes decorating the frontage. Mrs J M Shaw, was she JW’s mother, sister-in-law or his wife? The 1911 census has a few entries for a John William Shaw or J W Shaw, but one stands out more than the others while looking for a JW with a J M….Bingo! Clicking on the link to open the image all is confirmed and more information is now known. The house on 22 Ramsey Street, Bradford is the home to JW and his wife of under one year, Julia May. John William is 25 years old, a Brewer’s Clerk from Bradford and Julia is five years his junior, aged 20, giving her place of birth as Norton, Staffordshire. John William had married Julia May Frost in the summer of 1910 according to FreeBMD. 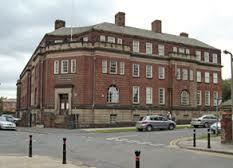 JW, born in 1886, was the son of John William Shaw and his wife Annie, who in 1901 lived in Swinton Place, Bradford. Back to John William and Julia May – did they have any children? FreeBMD, when using the elements of Shaw and Frost to search a birth, brings up a couple of possibilities. But I have a record that will confirm this, and will share later. Now it is military service time. A look on Ancestry brings up a Medal Card which tells that JW served in the 6th Batt. York & Lancs Regiment after enlisting on the 24th of January 1917, there is also a discharge date and medal entitlement. But unusually, FindMyPast comes up trumps this time, with a set of Service Records! On the 24th of January John William Shaw aged 30 years and 7 days Attested in Halifax into the 86 Training RFS, York & Lancaster Regiment, becoming Private 32832. His address, as I know, was 22 Ramsay Street, Bradford. His occupation, I already know, from looking at the 1911 census. He served at ‘Home’ (the UK), from the 24th of January 1917 to the 3rd of May that year. On the 4th of May, he was sent to France, returning to the UK on the 5th of September of the same year, 1917, until his discharge of 31st of October 1918 – a total of one year and 281 days. Apart from the details about his service, family information is also given and it here I come back to a point mentioned earlier – did John and Julia have any children? Yes, they did. But before I go into that part of their life, the record also tells that the couple married on the 14th of May 1910 (I knew it was the summer), in Dirkhill Primitive Methodist Chapel, Bradford. The children named in the document are John Leonard born 13th of July 1912 and Reginald born 27th of June 1914. John William received a GSW (gunshot wound) to his left leg on the 20th of August 1917. His Service Record notes that he was ‘seriously ill’. Nine days later he was no longer classed as seriously ill. Could this be to the fact that he had his left amputated? A form from the 2/1st Southern General Hospital, Dudley Road, Birmingham gave authorisation for JW to be discharged from the hospital on the 12th of March 1918 in ‘indefinite furlough, pending admission to Roehampton. The 2/1st Southern General Hospital in Birmingham was a Territorial Force hospital, later becoming City Hospital. 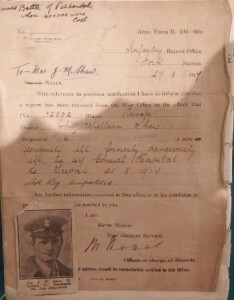 There are a few documents included in JW’s military records, one, in particular is his service will, which tells of the ‘final disposal and to whom sent’, the words ‘To Man 2-11-1918’ tell that he took his belonging home with him. 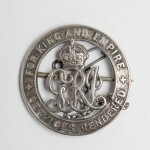 As JW was injured during the war and became unfit to serve, he became eligible for The Silver War Badge. The badge was to be worn on the right breast or on the right lapel of the jacket but not on a Naval or Military uniform, according to the the form accompanying each man’s badge. I must say that the wrighting of the clerk who wrote the information relating to JW on the form had a wonderful hand, with the each of the capital letters being flourished and the letters going below the lines having a neat loop as embellishment. John William and Julia May are both found in the 1939 Register, still living on Ramsey Street, having moved across the road to number 25. John William is still employed as a clerk. FreeBMD has a death entry for a John William Shaw in 1953 – the age at death, 67, matches up with the birth year of 1886. I don’t know if JW had a happy life and marriage, but even with having one of his legs amputated he survived for 35 years. 35 years more than many of his brothers in arms. words ‘Wounded Battle of Pashendale where 400,000 were lost’. Who wrote this? Would it have been John William or his wife, Julia May? I don’t think that is a bad afternoon’s work and all from a slightly discoloured and curled at the edges piece of paper. If I can find out this much from one sheet of paper from nearly 100 years ago, just think what you, the family or local history researcher will be able to find. This entry was posted in General on February 26, 2017 by carol. Yesterday afternoon I met my friend for lunch. I have known her nearly 60 years and we seem to have, over the years gone through good times, very good times and the not so good – we have dealt with things in our own way but always been there for each other. We may not be in each other’s pockets on a day to day basis but if anyone asks who my best friend is, I do not hesitate and say her name. Before lunch, it was suggested that we pay a visit to the Open Day of the West Yorkshire History Center, which opens on Monday. The purpose built building sits on a plot of land in Kirkgate and it a very modern building, the very opposite of its predecessor on Margaret Street, Wakefield. machines. As you walk up the corridor to the research area you are greeted with a few display cases, which at the moment are focusing on WW1 items. The research area is large, bright and airy with plenty of tables and computer terminals, also having a reception desk area for ordering archive material. This room was quite busy but we were greeted as we entered by a member of staff, who we chatted to and my friend, Judy Gorbutt nee Alexander, explained that she had been brought up within yards of the centre, as her grandfather and father owned Alexander’s, which at one time had been a pet shop and seed merchants then became well known in the area as the place to go for fishing tackle. The member of staff suggested that Judy look in the Register of Deeds to see if she could find any information about the purchase of the Kirkgate shop. Guess what we did next? The Register of Deeds indices are housed in sliding units, well, we were like kids in a sweet shop. We had only a vague idea of the date of the purchase of the Kirkgate shop, therefore, a process of elimination took place. We did find him owning property on Haddingley Hill, Milnthorpe Lane and a few other places – the Kirkgate shop seemed to be as elusive as the man himself, as he had been hard to find in many records, his life still remains a mystery in many decades. Armed with this information, Judy and I continued our visit looking at the conservation area -many items looking familiar to those in my art teacher’s room at school. The archival collections held by are an unparalleled record of the history of the West Riding of Yorkshire and its communities from 1194 to the present day. 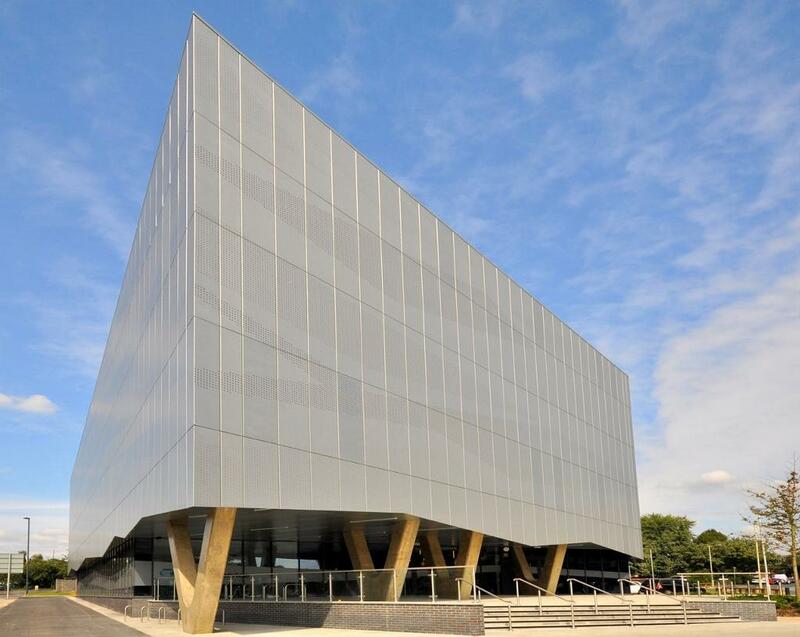 The West Yorkshire Archive Service in Wakefield is the third largest local authority archive in Great Britain comprising over 10 million documents. The service exists to make this history accessible to the public and to look after the region’s heritage for future generations. Many collections have national significance, among them the unique records of the pioneering Stanley Royd Mental Health Hospital, recently awarded international status as part of the UNESCO UK Memory of the World Register. Other major collections that will be cared for at the centre are the unparalleled West Riding Registry of Deeds made up of 12,763 volumes containing 7 million extracts of property transactions from 1704 to 1970, as well as the massive National Coal Board collection of over 2000 boxes relating to collieries and coal miners in Wakefield and the south Leeds area. The History Centre cares for the late John Goodchild’s collection which represents an unrivalled and rich source of information for local history research and contains manuscripts, books, maps, illustrations, indexes and research files covering a vast range of subjects and stories associated with local individuals and organisations. Our visit over it was time to venture out back into a cold, wet and dismal Wakefield to decide where to go for lunch and a chat. But with so many records available to researchers it looks like another visit is on the cards. This entry was posted in General, News on February 12, 2017 by carol.